When I heard that Buddy Guy and George Thorogood were playing at our local Auditorium, my first thought was to get the tickets, get the kids and go! My kids have been listening to Thorogood’s Greatest Hits album during carpool for almost 3 years. They can sing and shout along with most of the songs, though I do try to skip any about drinking alone or ordering several drinks at ounce. The other reason that it seemed like a good idea was that our local auditorium is used for ballet, speaker series and local performances. It is not a pot-smoking, head banging venue with all kinds of dangerous characters. This is Swank, you know. We can be a mild-mannered, rather uptight bunch. We met friends for pizza and the moms decided that we would even eat that extra slice–knowing that a night of dancing was ahead of us. We were all excited, we knew we were about to see fun music and to be able to take your kids to their first rock and roll concert is Visa-commercial priceless. We settled into our 11th and 12th row seats and just waited for the magic to happen. Buddy Guy appeared on stage with little fanfare, and he didn’t need any, he was fingers on fire awesome. The kids sat upright on the edge of their seats as the music ripped and the lights flashed. I was ready to get everybody on their feet and get the party started when I looked around. Every person in the theater, save one, was sitting like a stone in their seat. 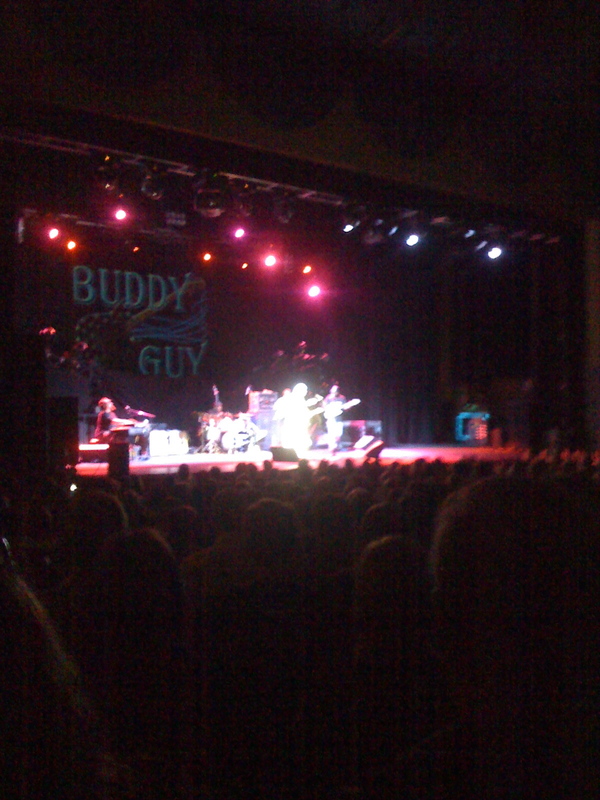 All 2000 fans in their sold out seats stared at Buddy Guy. The occasional person would bob their head, but it was like we were in church. Then, entering the theater late, danced in Buddy’s biggest fan. He was dancing, he was grooving, he was whooping and hollering–regular normal at most concerts, right? It didn’t take long for the elderly theater usher to make her way to his seat, which was a few rows in front of us. Next came security–an uncertain man, hesitant and small in stature. probably after working at the auditorium for years had never seen anything like this, a man who wants to dance and sing along with the music? The nerve. My daughter leaned forward and asked if that man was drunk. No, I said, I think he is enjoying the music. The security man was not effective, so the blue hair bunch of men behind him asked him to sit down again. Then it was curse word and pick a fight alley. I was hovering over my kids like a bird wrapping my wings around them. Next, a woman came dancing down the aisle. She wore a sparkly sequined hat, a tank top with no bra, and hairy armpits, as the kids quickly pointed out. She was shaking it like nobody’s business. Normal concert, right? Nope. The security called the police and these people were carted away. WTF? No dancing at the concert??? It was the first time I had experienced that. I have been to many a concert, and I have never seen people out and out fighting and wanting to deck each other, either. Maybe there is a time and place for beer and mixed drinks–these people needed to mellow out! Meanwhile, I’m having a personal conflict. Concerts aren’t really that fun if you have to bounce around in you chair instead of dance. What are my kids going to think a rock concert is all about? I don’t want them thinking that you just sit prudely in your chair. Part of me wanted to stand up and dance. The other part of my didn’t want to go against the 1998 person flow and get hauled out by the cops with my kids. We enjoyed the concert, but we all left a little confused. It felt like we were just in a scene from Footloose 2008. I was trying to avoid the alcohol and the pot by choosing this venue, but, I have to say, next time we are hitting the big arena. You gotta dance baby, you gotta dance. This entry was written by Mermaid and posted on July 31, 2008 at 10:01 pm and filed under Uncategorized, Worst Mom Ever with tags Buddy Guy, concert, George Thorogood, kids, swank county. Bookmark the permalink. Follow any comments here with the RSS feed for this post. Post a comment or leave a trackback: Trackback URL.